Looking for Panama City Beach Fishing Charters? Fishing charter knowledge and experience are everything. 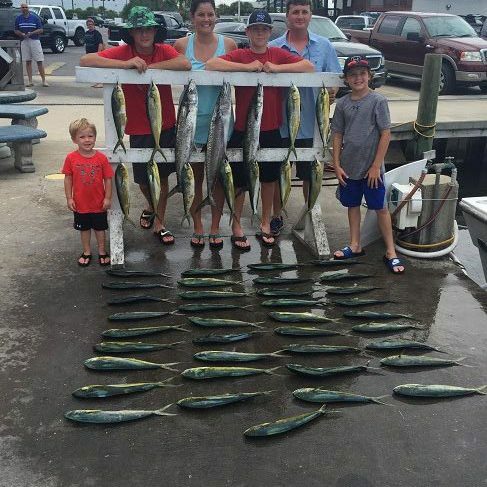 Kelley Girl Panama City Beach Fishing Charters is a family run and operated business. Captain Mark Kelley was born into a family of fishermen. Both, his Grandfather and Father were commercial and charter fishermen. Captain Kelley turned his passion into a successful business over the last 35 years. Captain August Redding is also a part of the Kelley Girl Charters, Panama City Beach, Fishing Team and has been in this business for 14 years. Whether you’re a first time fishermen or have years of knowledge, we happily welcome all levels of experience and love to share this passion with everyone who gets on the boat with us. Choosing to fish with us means you’ll be in good hands with a very experienced and passionate deckhand. Our goal is to ensure we have a safe and fun day on the water and provide you with everything you need to reel in the big ones! Call us today to schedule your Panama City Beach Fishing Charters. If you want to fish but don’t want to lose sight of land, the four-hour trip is the one for you. This trip is a great trip for beginners or young children. In the spring season (March and April), trolling for spanish mackerel and sheepshead makes for an exciting experience. On this trip, the Captain will fish in St. Andrews Bay, in the pass of St. Andrews, or off the beach. Later in the season, fishing for king mackerel, bonito, dolphin fish, cobia, and bluefish are the targets. These trips expand to 6 or 7 miles offshore. 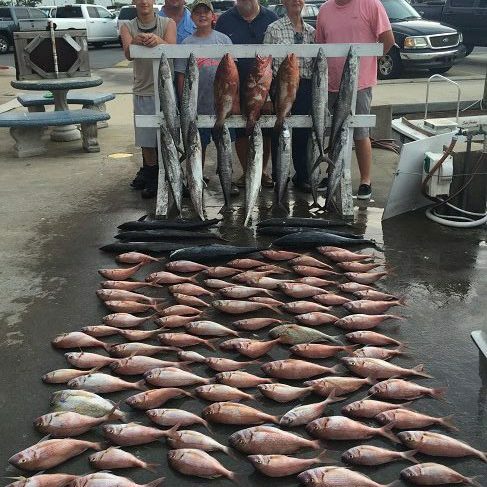 Most of the fish caught during the 4-hour trip range from 3 to 15 lbs. If your desire is to venture further off-shore, the six-hour trip could be considered an extension of the 4-hour trip. During this trip, anglers can troll as well as participate in short bottom fishing excursions. 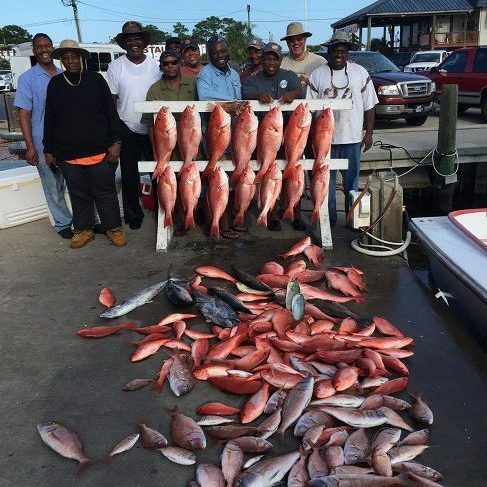 In addition to trolling for the fish indicated in the 4-hour trip, anglers can bottom fish for vermilion snapper, white snapper, triggerfish, and red snapper. On this trip, the Captain may take you up to 15 miles offshore of the panhandle into the Gulf of Mexico. This is a great trip to get your “feet wet” on some bottom fishing and also a great trip for kids. In addition to trolling for the fish indicated in the 4-hour and 6-hour trips, anglers can bottom fish for a variety of snapper, amberjack, triggerfish, and an occasional grouper. On this trip, the Captain may take you up to 20 miles offshore of the panhandle into the Gulf of Mexico. Because the length of this trip allows you to travel further off-shore, anglers find high speed trolling very exciting. As you travel to and from the off-shore reefs, the deckhand will drop lines overboard. 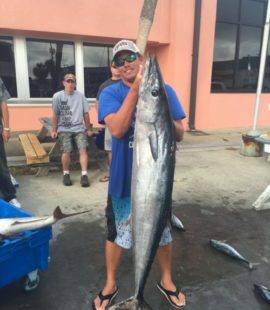 Fish such as wahoo, king mackerel, dolphin fish, bonito, and others have been caught. These are our most popular trips. Anglers booking these trips often say, “I want to catch the big ones, Captain!” If you are serious about fishing, these trips are for you. Booking these trips allow the crew to fish reefs offshore that house the larger red snapper, grouper, and amberjack. The longer the trip, the more fishing time you have. Because the length of this trip allows you to travel further off-shore, anglers find high speed trolling very exciting. As you travel to and from the off-shore reefs, the deckhand will drop lines overboard. Fish such as blue marlin, wahoo, tuna, dolphin fish, bonito, and others have been caught. If you’re looking to spend all day on the water and you love to fish, either of these trips is for you! On the shark fishing trip, we recommend at least a 5 or 6-hour trip. The recommended months are May through October. This is for a very patient fisherman. It is a waiting game where you have to be very patient. Shark fishing can be very exciting or sometimes it takes a lot of waiting. 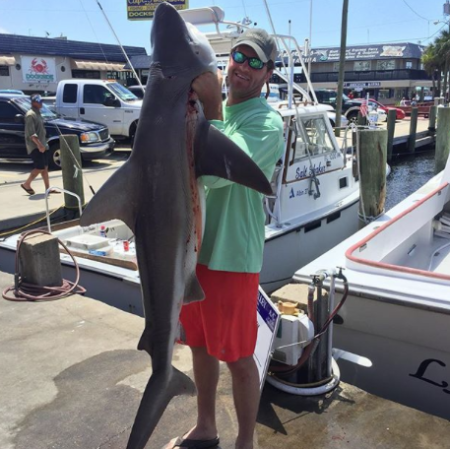 We catch a variety of sharks bull shark, tiger shark, hammerhead, sand tiger, and dusky. We do keep the sharks you catch if it is legal and you are wanting to have him cleaned to eat. If you want to catch something big that fights hard, then this may be for you. Looking for a Fishing Charter company in Panama City Beach? Look no further. Kelley Girl Fishing Charters has a variety of trip options available and the experience to give you a fun and successful trip out at sea. The Kelley Girl is a 52. ft. Fishing boat and the Lady Kelley is a 55 ft. boat. We have plenty of fishing room for up to 20 people on the Kelley Girl and/or 20 on the Lady Kelley. Our boats have bathrooms, air conditioning and exceed the U.S. Coast Guard regulations. Captain Mark Kelley of the Lady Kelley and Captain Kory Freed of the Kelley Girl are always ready to reel in the big ones. The Captains at Kelley Girl Charters have plenty of fishing experience to make sure you have a fun and successful trip! We offer 4, 6, 8, 10, 12, and 16 hour trips as well as a 2-day trip. Shark Fishing trips are also available. Kelley Girl Charters also offers trolling and bottom fishing. 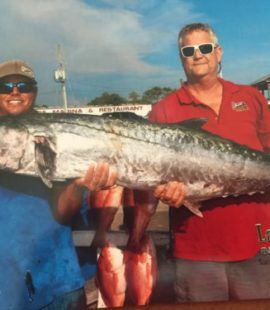 Trolling: you catch King Mackerel, Spanish Mackerel, Dolphin, Bonita and Blue Fish. 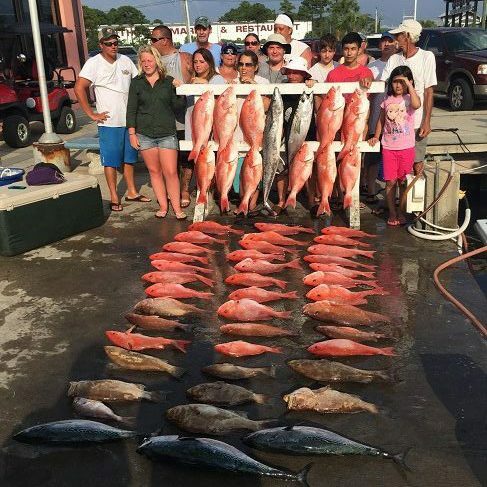 Bottom: you catch Red Snapper, White Snapper, Vermillion Snapper, Grouper, Amberjack and Trigger Fish. A deposit is required upon booking a trip. We accept MasterCard & Visa. Thank you, The Management at Kelley Girl Charters. Average gratuity is 15% of the total price of the trip. Prices can be adjusted according to fuel prices. We do require a $300 deposit if one boat is chartered and a $500 per boat deposit if two or more boats are chartered. Food & Drink: We ask that you provide your own food and drinks for the trip. Coolers are permitted. Alcohol is allowed but please refrain from bringing liquor. Sun Protection: The Florida sun is very strong so make sure you bring sunscreen. Bringing a hat and sunglasses would be helpful, too. Seasickness Medication: If you struggle with motion sickness, please consider bringing an over the counter medication. We want you to enjoy yourself! Coolers For Your Catch: Andersons Seafood Market will clean your catch for a fee. Fishing License & Knowledge of Laws: Kelley Girl Charters provides Fishing License & knowledge on current laws in regards to size and catch limits as well as available species. We know where and how to catch it and what we can catch and keep. Rods, Reels, Hooks, Weights & Lines: All the fishing gear you need for a successful trip! Experienced Deckhand: Experience is key to helping you catch the big ones! When a loved one passes away, we know families strive to grant their wishes. Kelley Girl Charters offers cremation trips that allow up to 20 family, friends and loved ones to gather and mourn, remember and celebrate the life of the deceased. Click for more information on a cremation trip. Welcome to Panama City Beach! If you’re just visiting, here are some accommodation options in the heart of Panama City Beach and a quick drive from where Kelley Girl Charters is located.